Will an apple a day really keep the doctor away, or do apples deserve their role of forbidden and poisonous fruit popularised in religious texts and folklore? Just in time for your New Year’s resolutions, we look at some of the compounds present in this popular fruit in detail. 1. Before you panic, rest assured that apples are fine to eat, and are indeed one of our favourite foods here at Picture It HQ. As this wikipedia article suggests, the bad press may have come about either because the Latin word for apple (malum) is written the same as the Latin word for evil, or because all foreign fruit used to be called apple. 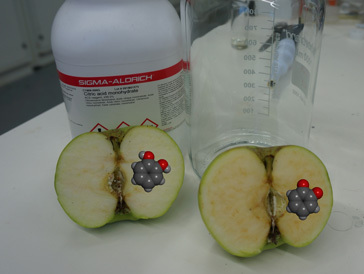 Just like the round-bottomed flasks in the main picture, which are an important part of any chemistry laboratory and can be used both to hold liquids and to carry out reactions, apples are a versatile ingredient in sweet and savoury cooking. Apples contain a number of interesting chemical compounds,* some of which we want to explore here. The picture shows just a few examples, such as malic acid (first isolated from apples, as indicated by its German name (Apfelsäure), which translates directly into “apple acid”), pectin (important in making your marmalades and jellies set firm), amygdalin, and some so-called flavonol molecules (quercetin, epicatechin and procyanidin B2 are shown), which are present in many fruits and vegetables. Flavonols belong to a family of compounds called flavonoids and are promoted for their antioxidant properties, thought to play a role in protecting organisms from a variety of diseases. They also contribute to reddish colours and are mostly present in the peel of apples, contributing to the attractive red colouring of popular cultivars. While it is not clear whether these compounds survive digestion and get taken up by the body,** it is worth eating apples with their peel for the fibre content as well. Indeed, several marketing and health campaigns (you may have heard “An apple a day keeps the doctor away“) have sought to promote apples as a beneficial snack, not in the least because they are quite easy to grow and transport, making them available cheaply in many countries. Again, as this recent article indicates, apples may again be standing in for a wide variety of fruit, as they are commonly associated with healthy eating. Browning of apple flesh when exposed to air. The left half has been treated with citric acid, which, like lemon juice, prevents browning, while the right half has been allowed to change over time. The molecules shown are a diphenol (left), which is converted to a benzoquinone, a building block of brown melanin polymers. 2. Once cut or bruised, the flesh of most apples browns quite quickly when exposed to air, which can be reduced and even prevented by sprinkling lemon juice over them, or by blanching apple slices in hot water. The reaction taking place is an oxidation (more about reduction and oxidation in our post on horsetails), converting phenolic compounds into quinones (Scheme 1). Scheme 1: Apple oxidation by polyphenoloxidase (PPO). Phenolic compounds contain an aromatic ring (known as a phenyl group and abbreviated to Ph in some chemical drawings) connected to at least one hydroxyl (OH) group (Scheme 1 shows a diphenol, also known as a catechol). 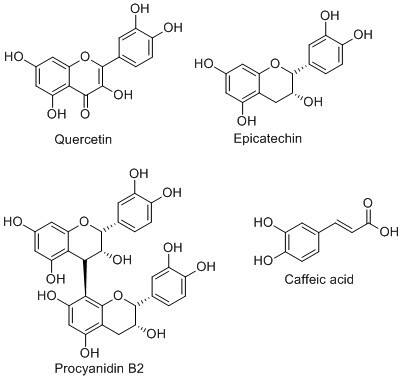 The flavonol compounds mentioned above are phenolic (see Scheme 2 for details of their structures), and apples also contain other compounds with these functional groups, such as caffeic acid (3-(3,4-Dihydroxyphenyl)-2-propenoic acid), a derivative of cinnamic acid. The oxidation reaction taking place is catalysed by an enzyme called polyphenoloxidase (PPO), and it produces quinones, which are then thought to polymerise to form a type of melanin, a brown pigment. 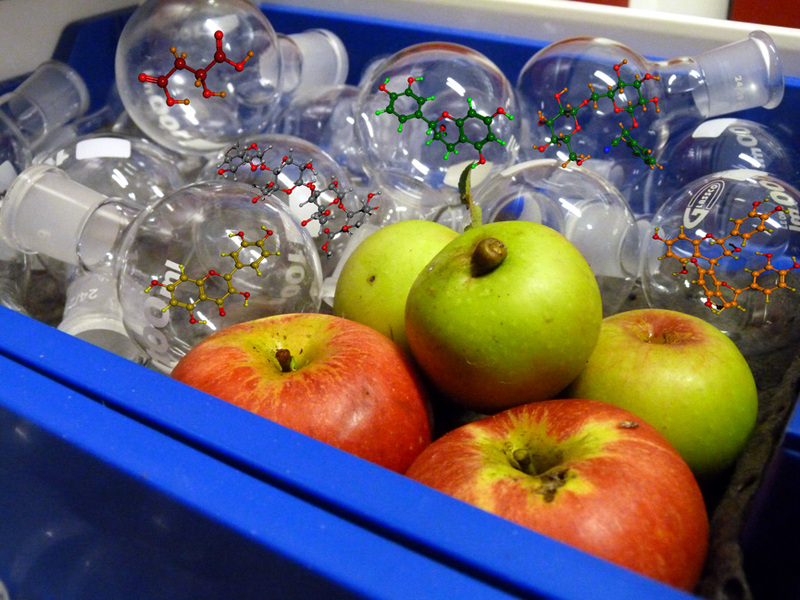 Scheme 2: Some of the phenolic compounds present in apples. The acids present in lemon juice include citric acid and they are likely to damage (denature) the polyphenoloxidase enzyme, slowing down or preventing the oxidation reaction leading to browning. Similarly, blanching the cut apples will denature the enzyme, while the exclusion of air from cut surfaces, e.g. by dropping apples into water, can also help to prevent the reaction. The same oxidation process takes place in avocados, sliced bananas and many other fruit, funghi and vegetables. 3. The sourness of green apples is caused by malic acid, a compound which contains a chiral centre and occurs naturally as a single isomer (-)-malic acid, (S)-hydroxybutanedioic acid. In contrast, industrial production generally gives a racemic mixture, followed by chiral resolution if a single enantiomer is required. 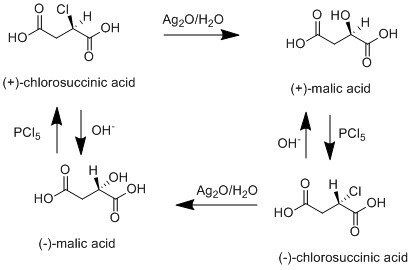 Malic acid takes part in the Walden cycle, an example of the inversion of a chiral centre by carrying out a series of reactions. The reaction is shown in Scheme 3 and the inversion of configuration at chiral centres, occuring for example during SN2 reactions, is still called Walden inversion in some text books. Curiously, the poisoned apple of folklore might have some link with one of the compounds present in apples, or, more accurately, in apple pips. This compound is called amygdalin, and structurally this is a glycoside, i.e. a sugar molecule bound to another functional group via a glycosidic bond (our recent post on sugar explains more about this type of bond). Amygdalin is also present in almonds, especially bitter almonds, and in a range of other stone fruit (Food Chemistry 2014, 152, 133-139), and it can be decomposed by enzyme catalysis to release hydrogen cyanide, HCN, a toxic compound made famous by the suicide pills of war and spy movies. Amygdalin and a synthetic derivative called laetrile were investigated for the treatment of some cancers, but found to be too poisonous as well as ineffective in scientific trials. However, accidentally swallowing an apple pip is not a problem – a whole pip will not be broken up during digestion, and even if you’ve crunched it (and most of us will have tried this when we were younger, go on, you know who you are…), its amygdalin content is so low that you would have to eat an awful lot of apple seeds to poison yourself. Almonds have been bred to have a low amygdalin content, but, as this note explains, you should be careful about almonds found in the wild. 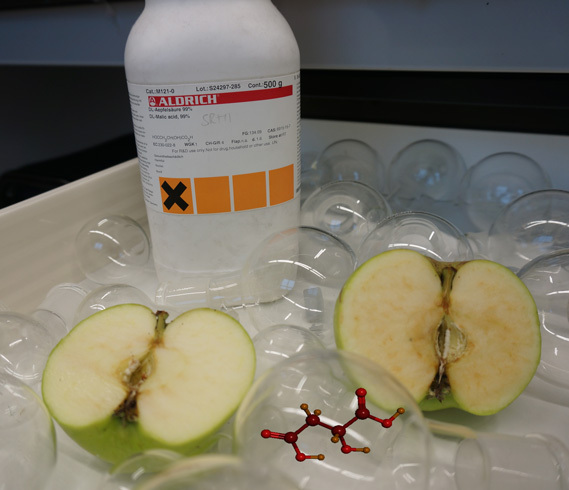 As with many compounds in the chemical laboratory, working on a small scale is the safest approach here, and you can safely continue to have apples in your diet. Categories: Autumn, Cookery, Food, Fragrance, Jam, Organic, Oxidation, Pectin, Plants, Poison, Scent | Tags: apple, autumn, chemistry, cooking, fibre, food, fruit, medicine, scent, science | Permalink.